Tigris Shrine Circus. 10:30 a.m., 2:30 & 7 p.m.; & March 31. See acrobats, clowns, animals and more. The show is about two and a half hours long, including a half-hour intermission. A benefit for Shriners Hospitals for Children. Toyota Coliseum, State Fairgrounds, Geddes. $20/general admission; free/age 2 and under. (Advance purchase prices are lower.) (315) 478-0277. TigrisShrineCircus.com. Egg Drop. 2:30 p.m. Children can attempt to build a container that, when dropped from various heights, will protect an egg from breaking; for ages 5-12. Hazard Branch Library, 1620 W. Genesee St., Syracuse. Free. (315) 435-5326. Tigris Shrine Circus. 10:30 a.m., 2:30 & 7 p.m. See March 30 listing. Teen Easter Egg Hunt. 11 a.m.-1 p.m. Take an hour to find as many eggs as you can, then get a chance to decorate them. NOPL North Syracuse, 100 Trolley Barn Lane, North Syracuse. Free. (315) 458-6184. nopl.org. Alice in Wonderland. 12:30 p.m. The Magic Circle Children’s Theatre presents an interactive version of the tale, in which children in the audience help Alice play croquet with the Queen, color the roses red, and join in the Wonderland fun. Children are invited to dress as their favorite fairy tale character. Spaghetti Warehouse, 689 N. Clinton St., Syracuse. $6. Reservations recommended: (315) 449-3823. Chemsations. 2 p.m.; also April 15. Local high school students demonstrate chemical reactions with color changes, bubbles and light. Sciencenter, 601 First St., Ithaca. Admission: $8/adults; $7/seniors; $6/ages 3-17; free/under 3. (607) 272-0600. sciencenter.org. Learn and Grow Espanol (Ages 0-2). 9:30-10 a.m.; also April 9. Instructor Kristie Rodriguez teaches this class using songs, games and hands-on activities. Fee payable directly to instructor by cash or check. Fayetteville Free Library, 300 Orchard St., Fayetteville. $7/child. Registration required: (315) 637-6374. ffl.org. Learn and Grow Espanol (Ages 3-5). 10:30-11:15 a.m.; also April 9. Instructor Kristie Rodriguez teaches this class using songs, games and hands-on activities. Fee payable directly to instructor by cash or check. Fayetteville Free Library, 300 Orchard St., Fayetteville. $7/child. Registration required: (315) 637-6374. ffl.org. Study Group. 3-5 p.m.; also April 9, 16, 23 & 30. Teens can get together with friends to get a start on homework; additional assistance available 4-5 p.m. Betts Branch Library, 4862 S. Salina St., Syracuse. Free. (315) 435-1940. Monday Funday. 5 p.m.; also April 9, 16, 23 & 30. Children ages 5-12 can make a craft. Maxwell Memorial Library, 14 Genesee St., Camillus. Free. (315) 672-3661. maxwellmemoriallibrary.org. Multiple Moms Mingle. 6 p.m. Monthly meeting of mothers and expectant mothers of multiples. Twin Trees Too, 1029 Milton Ave., Syracuse. For more details and to reserve if you wish to attend: multiplemomsmingle.com. Sign Language Storytime. 10:30-11 a.m.; also April 17. Children ages 3-6 can learn several signs that correspond to the stories that day. Fayetteville Free Library, 300 Orchard St., Fayetteville. Free. (315) 637-6374. fflib.org. Read, Sing and Play. 10:30 a.m.; also April 10, 17 & 24. Children ages 1 ½ to 5 and families or caregivers can enjoy stories, games, fingerplays and songs. Petit Branch Library, 105 Victoria Place, Syracuse. Free. (315) 435-3636. Terrific Tuesdays. 4-7:30 p.m.; also April 10, 17 & 24. Children of all ages and their families can drop in, read together, play a board game, make a craft or engage in other activities. Maxwell Memorial Library, 14 Genesee St., Camillus. Free. (315) 672-3661. maxwellmemoriallibrary.org. First Steps. 9:30-10 a.m.; also April 11, 18 & 25. Children who are good walkers, up to age 3, can with a caregiver take part in a program with music, movement, crafts and more. Fayetteville Free Library, 300 Orchard St., Fayetteville. Free. (315) 637-6374. fflib.org. Baby Storytime. 10:30-11:30 a.m.; also April 11, 18 & 25. Babies and caregivers can share rhymes, songs, stories and signs in this language-building program. Fayetteville Free Library, 300 Orchard St., Fayetteville. Free. (315) 637-6374. fflib.org. Early Learners Storytime. 11 a.m.; also March 14, 21 & 28. Children ages 2-4, with accompanying adult, can take part in a session with stories, rhymes, songs and crafts. Salina Library, 100 Belmont St., Mattydale. Free. (315) 454-4524. salinalibrary.org. Homeschool STEAM Club. 1:30-3 p.m. Homeschoolers ages 5-10 can learn about science, technology, engineering, art and math with hands-on activities and experiments. Liverpool Public Library, 310 Tulip St., Liverpool. Free. (315) 457-0310. lpl.org. Teen Game Day. 3-5 p.m. Young people age 12 and up can join game pros from TCGplayer for Magic: The Gathering, Pokemon and YuGiOh!. Beginners are welcome. Betts Branch Library, 4862 S. Salina St., Syracuse. Free. Registration encouraged: (315) 435-1940. After School at the Library. 3:30 p.m. Kids age 5 and up can play with Legos. Paine Branch Library, 113 Nichols Ave., Syracuse. Free. (315) 435-5442. Teen Geeks. 6-8 p.m.; also April 18. Teens can play board games in the first session of the month and video games in the second. Liverpool Public Library, 310 Tulip St., Liverpool. Free. (315) 457-0310. lpl.org. Words and Music Songwriter Woodshed. 6:30-9 p.m. Songwriters of all ages and skill levels can bring work, and get and give constructive opinions and suggestions. Liverpool Public Library, 310 Tulip St., Liverpool. Free. (315) 457-0310. lpl.org. Preschool Storytime. 10:30 a.m.; also April 12, 19 & 26. Children ages 3-5 can hear stories and then make a craft. Siblings welcome. Maxwell Memorial Library, 14 Genesee St., Camillus. Free. (315) 672-3661. maxwellmemoriallibrary.org. Mixed-Bag Movies. 3:30-5:30 p.m. See Wonder (PG-13), about a fifth-grader with physical differences who enters mainstream school for the first time. Liverpool Public Library, 310 Tulip St., Liverpool. Free. (315) 457-0310. lpl.org. Teen Open Homework Hour. 3:30-4:30 p.m.; also April 20. Young people ages 12-18 can come by for homework help and healthy snacks. Hazard Branch Library, 1620 W. Genesee St., Syracuse. Free. (315) 435-5326. Public Fishing. 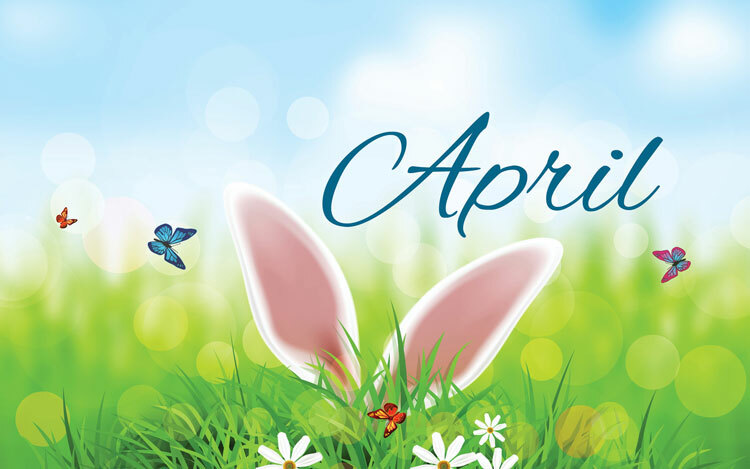 9:30-11:30 a.m.; also April 14, 21 & 28. Families and individuals can come for a morning of fishing; bait, rods and reels provided. Volunteers are on site to help beginners. (Fishing license not required.) Carpenter’s Book Fish Hatchery, 1672 Route 321, Elbridge. $5/person. Registration required: (315) 689-9367. Build on Your Nature Knowledge. 10 a.m.-noon; also April 28. Kids can join a naturalist to construct things that will benefit wildlife: a bat house (April 7) and a bird feeder (April 28). Beaver Lake Nature Center, 8477 E. Mud Lake Road, Baldwinsville. $7/child; $4/vehicle. Registration required: (315) 638-2519. Paws to Read. 10:30-11:30 a.m.; also April 14, 21 & 28. Kids can read to a friendly dog from Paws Inc. of CNY. Liverpool Public Library, 310 Tulip St., Liverpool. Free. (315) 457-0310. lpl.org. Paws and Books. 10:30 a.m.; also April 21. Kids ages 5-12 can read a story to Cooper, a dog certified as a Canine Good Citizen. Afterward, they can stay to make a dog-related craft. Hazard Branch Library, 1620 W. Genesee St., Syracuse. Free. (315) 435-5326. Pups ‘n Pages. 11 a.m.-noon; also April 21. All ages of participants can come read to or just hang out with a dog. NOPL Cicero, 8686 Knowledge Lane, Cicero. Free. (315) 699-2032. nopl.org. Family Day at the Everson. Noon-3 p.m. Take part in art-making activities inspired by current exhibitions; help create a collaborative community mural and listen to storyteller Vanessa Johnson; and watch a West African dance and drum performance (1:30 p.m.). Everson Museum of Art, 401 Harrison St., Syracuse. Free. (315) 474-6064. Ukulele for Beginners. 1-2 p.m. Pat Doherty teaches a class for newcomers to the ukulele. Liverpool Public Library, 310 Tulip St., Liverpool. Free. (315) 457-0310. lpl.org. Open Chess. 2-4 p.m.; also April 14, 21 & 28. Players of all ages and levels can meet up with others for a game; beginners welcome. Boards available or bring your own. Petit Branch Library, 105 Victoria Place, Syracuse. Free. (315) 435-3636. Sciencenter Showtime. 2 p.m.; every Saturday. In upcoming sessions of this weekly interactive series, topics will include: robotics; engineering (April 14, noon & 2 p.m.); ice and water; and space and earth science. Sciencenter, 601 First St., Ithaca. Admission: $8/ages 2-64; $7/seniors, age 65-plus; free/under 2. (607) 272-0600. sciencenter.org. Marble Run Fun. 2:30 p.m. Kids ages 5-12 can build a unique track for marbles to race through. Hazard Branch Library, 1620 W. Genesee St., Syracuse. Free. (315) 435-5326. Local Author Meet and Greet. Noon-2 p.m. Local authors of children’s, teen and adult books will talk about their work, and sell and sign their books. Liverpool Public Library, 310 Tulip St., Liverpool. Free. (315) 457-0310. lpl.org. Hospital vs. Homebirth. 6-7:30 p.m. Learn the facts about hospital and homebirths, and discuss common myths. Sponsored by the Doula Connection. CNY Healing Arts (parking and entrance in back of second building), 195 Intrepid Lane, Syracuse. Free. Registration recommended: (607) 483-8284. Yoga Storytime. 10:30-11 a.m. Children ages 3-6 take part in a full-body experience that incorporates yoga poses, breathing exercises, songs and more. Mats are provided; socks must be worn. Fayetteville Free Library, 300 Orchard St., Fayetteville. Free. Registration required: (315) 637-6374. ffl.org. Teen MOPS. 4-6 p.m. Young mothers, ages 13-21, with children under 6 enjoy a faith-based program with fun, food and activities while their children are cared for by the childcare program. Liverpool First United Methodist Church, 604 Oswego St., Liverpool. Free. (315) 569-2542. Creation Station. 4:30-7 p.m. Kids ages 5-12 can stop by to make three spring-themed crafts. Hazard Branch Library, 1620 W. Genesee St., Syracuse. Free. (315) 435-5326. Superhero Storytime. 6:30-7 p.m. Kids ages 4-6, with a caregiver, can dress as a superhero, hear stories and make crafts. NOPL North Syracuse, 100 Trolley Barn Lane, North Syracuse. Free. (315) 458-6184. nopl.org. Let’s Pretend. 1 p.m. Children ages 3-5 learn about an animal that lives at Beaver Lake by acting out how the animal behaves. Each program includes a craft and outdoor activities. Beaver Lake Nature Center, 8477 E. Mud Lake Road, Baldwinsville. $5/child; $4/vehicle. Registration required: (315) 638-2519. Teen Anime Night. 6-8 p.m. Teens can come and talk about anime. Cosplay is okay, but library staff must approve. Liverpool Public Library, 310 Tulip St., Liverpool. Free. (315) 457-0310. lpl.org. Teen Writing and Drawing Group. 3:30-5 p.m. Teens can share art or writing, get feedback, and talk about their projects. Petit Branch Library, 105 Victoria Place, Syracuse. Free. (315) 435-3636. Open Late Til 8. 4-8 p.m. Explore a science theme in a sensory-friendly environment, with activities for adults and for those with sensory issues. The museum offers quiet areas where participants can sit, relax and regroup. Museum of Science and Technology (MOST), 500 S. Franklin St., Armory Square, Syracuse. Museum admission: $5 (ask for the sensory-friendly rate to get discounted admission). (315) 425-9068. most.org. Tuition and Other College Concerns. 6:30-8 p.m. John Decker of College Assistance Plus will talk about tuition-reduction programs as well as marketable majors and NCAA sports regulations. Liverpool Public Library, 310 Tulip St., Liverpool. Free. (315) 457-0310. Registration required: lpl.org. Time for Tots Playgroup. 9:30-10:45 a.m.; also April 27. Education playgroup for children ages 18 months-5 years and their caregiver. Stories, songs, arts and crafts, and more. Cross of Christ Lutheran Church, 8131 Soule Road, Liverpool. $3/family. Registration recommended: (315) 622-2843. NYCrossofChrist.org/Tots. Star Party. 7:30-9:30 p.m. See constellations and planets through telescopes. Orion will be setting, being replaced by Leo the Lion. (Backup date: April 14.) Baltimore Woods Nature Center, 4007 Bishop Hill Road, Marcellus. $9. (315) 673-1350. Register: baltimorewoods.org. Good Samaritan 5K & 10K Run/Walk. 9:30 a.m. Event begins with a kids’ sprint, followed by a 5K and 10K. Music and other entertainment, after the run/walks. A benefit for Christian Health Service of Syracuse, a local medical mission. Long Branch Park, Longbranch Road, Liverpool. $30-$35/adults; $15/ages 5-12. goodsamaritanrun.org. Kids Expo 2018. 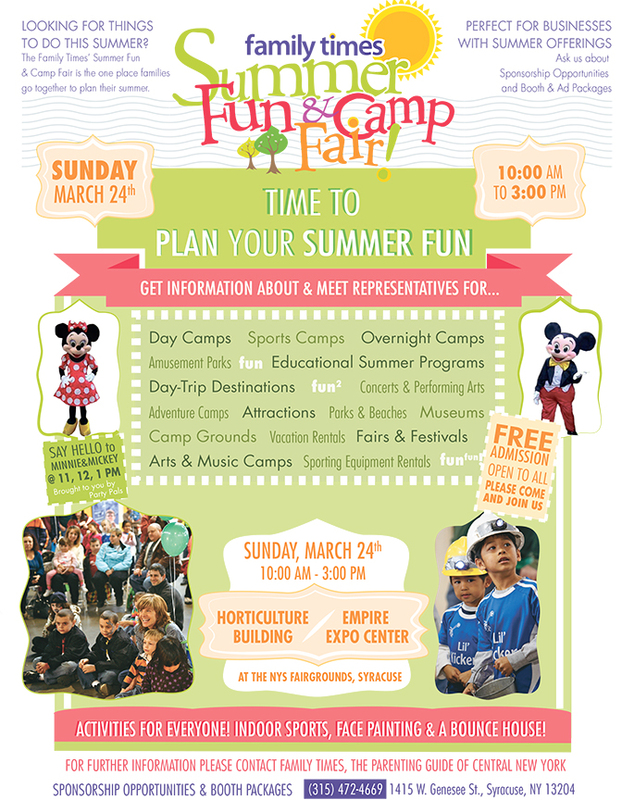 10 a.m.-2 p.m. At this event (formerly known as Summer Fun & Camp Fair), families can learn about summer camps and programs as well as shop for products and services for kids. There will be monster trucks to see, bounce houses to jump in, and a full slate of live performances. State Fairgrounds, Geddes. Free. (315) 472-4669. FamilyTimes.biz. Upcycling Cereal Boxes. 10-11:30 p.m. Participants age 10 and up can learn how to turn old cereal boxes into functional items. Liverpool Public Library, 310 Tulip St., Liverpool. Free. (315) 457-0310. Registration required: lpl.org. Meet the Orchestra. 10:30 a.m. Kids and parents can enjoy a Symphoria performance while learning about the instruments of the orchestra and the musicians who play them. The orchestra’s Instrument Discovery Zone opens at 10 a.m., before all Kids’ series performances. Inspiration Hall, 709 James St., Syracuse. $15/adults; $10/senior citizens; free/under 18. (315) 299-5598. ExperienceSymphoria.org. Rip Van Winkle. 11 a.m. Puppets tell the story of the generous man who accidentally sleeps his life away. Open Hand Theater, Shoppingtown Mall, Suite No. 3, 3649 Erie Blvd. E., DeWitt. $5. (315) 476-0466. openhandtheater.org. Hansel and Gretel. 12:30 p.m. The Magic Circle Children’s Theatre presents a comical, interactive version of the tale, in which the brother and sister are clueless until they get help from a leprechaun and children in the audience, and teach the grumpy witch the virtue of kindness. Children are invited to dress as their favorite fairy tale character. Spaghetti Warehouse, 689 N. Clinton St., Syracuse. $6. Reservations recommended: (315) 449-3823. Science Saturday. 2-4 p.m. Kids can make their own seed jars. Petit Branch Library, 105 Victoria Place, Syracuse. Free. (315) 435-3636. Rhyme Time. 10:30 a.m.; also April 30. Children from infants to age 2 (siblings of all ages welcome) can, with a caregiver, learn songs and nursery rhymes, followed by free play. Hazard Branch Library, 1620 W. Genesee St., Syracuse. Free. (315) 435-5326. Minecraft Nights. 5:30-6:30 p.m. Kids can compete with others their age and survival mode turned on. Liverpool Public Library, 310 Tulip St., Liverpool. Free. (315) 457-0310. lpl.org. Homeschooling 101 for Parents. 7-8:30 p.m. Parents of homeschoolers can learn about different topics; in this session, participants will discuss time management. Liverpool Public Library, 310 Tulip St., Liverpool. Free. (315) 457-0310. lpl.org. Xbox in the Evening. 5 p.m. Young people ages 12-18 can play on the Xbox One. Hazard Branch Library, 1620 W. Genesee St., Syracuse. Free. (315) 435-5326. Earth Day Crafts. 9 a.m.-5 p.m. Kids can make a craft from recycled materials. Liverpool Public Library, 310 Tulip St., Liverpool. Free. (315) 457-0310. lpl.org. Figure Drawing for Teens. 3-5 p.m. Join Teen Advisory Board member and artist Beyonce and learn to draw figures. Materials provided. Betts Branch Library, 4862 S. Salina St., Syracuse. Free. Registration encouraged: (315) 435-1940. Junior Café Scientifique. 9:30-11 a.m. The Technology Alliance of Central New York presents a talk on the subject of stem cells and their superpower. The talk is geared toward middle school students, who must be accompanied by an adult. Museum of Science and Technology (MOST), 500 S. Franklin St., Armory Square, Syracuse. Free. Register by email: jrcafe@tacny.org. Homeschool Open House. 10 a.m.-1 p.m. Homeschooling families and those considering it can share experiences and learn about local educational and enrichment opportunities. Liverpool Public Library, 310 Tulip St., Liverpool. Free. (315) 457-0310. lpl.org. Earth Day Cleanup & Festival. 10 a.m. Help beautify the neighborhood, then celebrate with a party that will feature music, food, face painting, and a magic show by the Twin Magicians. White Branch Library, 763 Butternut St., Syracuse. Free. (315) 435-3519. Under the Sea Day. 10 a.m.-3 p.m. The zoo’s Octo-Maze bounce house opens for the season. There’ll also be ocean-themed games, crafts and more. Rosamond Gifford Zoo, 1 Conservation Place, Syracuse. Zoo admission: $8/adults; $5/age 62 & up; $4/ages 3-18; free/age 2 and younger. Reservations required: (315) 435-8511, Ext. 113. rosamondgiffordzoo.org. Family Train Day. 10 a.m.-1 p.m. See trains on the permanent layout and running in loops on the floor. There is also a children’s play area. Presented by the Central New York Large-Scale Railway Society. The Commons, Driver’s Village, 5885 E. Circle Drive, Cicero. Free. cnylsrs.net. Hansel and Gretel. 12:30 p.m. See April 14 listing. Earth Day Project. 2 p.m. Participants can make their own musical instruments out of recycled materials. Petit Branch Library, 105 Victoria Place, Syracuse. Free. Registration required: (315) 435-3636. Lego Club. 2:30 p.m. Kids ages 5-12 can take turns playing Lego Dimensions on the Xbox One or build with actual Legos. Hazard Branch Library, 1620 W. Genesee St., Syracuse. Free. (315) 435-5326. Multicultural Artistic Experience. 6:30-10 p.m. Performances will range from West African Drums and Dancers to jazz vocalist Nancy Kelly, with many more. Event is family-friendly. Refreshment buffet served 6:30-7:30 p.m. May Memorial Unitarian Universalist Society, 3800 E. Genesee St., Syracuse. $10/family. (315) 446-4339. Family Dance. 6:30 p.m. Children and adults of all ages and abilities are welcome to join in fun and simple dances. United Church of Fayetteville, 310 E. Genesee St., Fayetteville. $2/adults; $1/teens & kids. syracusecountrydancers.org. Spring Adventure Week. 10 a.m.; daily through April 27. Featured creature program, 10 a.m. (daily) & 1 p.m. (April 23-26). Exploring with a Naturalist, 10:30 a.m. (daily). April 25, 1 p.m.: Skull Detectives, learning about animals’ lives by examining skulls. Live Birds of Prey program, April 27, 1 p.m. ($5; reservations required). Beaver Lake Nature Center, 8477 E. Mud Lake Road, Baldwinsville. Admission: $4/vehicle. (315) 638-2519. Family Movie. 1-3 p.m. In the movie Coco, aspiring musician Miguel enters the Land of the Dead to find his great-great-grandfather, a legendary performer. Liverpool Public Library, 310 Tulip St., Liverpool. Free. (315) 457-0310. lpl.org. Button Time. 2-4 p.m.; also April 24. Kids can come by and make their own button. Petit Branch Library, 105 Victoria Place, Syracuse. Free. (315) 435-3636. Tween Taste Challenge. 2-3 p.m. Kids ages 8-12 can taste test different foods. NOPL North Syracuse, 100 Trolley Barn Lane, North Syracuse. Free. Registration required: (315) 458-6184. nopl.org. Smartplay. 10:30 a.m. In this self-guided program, babies and toddlers can explore different types of play at their own pace. Fayetteville Free Library, 300 Orchard St., Fayetteville. Free. (315) 637-6374. fflib.org. Homeschool Chess Club. 1:30-3:30 p.m. Homeschoolers and families can learn to play chess or match strategies. Liverpool Public Library, 310 Tulip St., Liverpool. Free. (315) 457-0310. lpl.org. Teen Candy Olympics. 2-4 p.m. Teens can take part in the M&M Relay, a Candy Relay and more. NOPL North Syracuse, 100 Trolley Barn Lane, North Syracuse. Free. Registration required: (315) 458-6184. nopl.org. Giant Comic Strips. 2-3 p.m. Children in kindergarten and up can use large rolls of paper to make their own candy strips. NOPL Cicero, 8686 Knowledge Lane, Cicero. Free. Registration required: (315) 699-2032. nopl.org. Break Week at Hazard. 2:30 p.m.; daily through April 26. Each day create something different; for ages 5-12. Hazard Branch Library, 1620 W. Genesee St., Syracuse. Free. (315) 435-5326. Spring Break Food Frenzy. 5 p.m. Take part in a blind taste test, then make snacks with the ingredients; for ages 12-18. Hazard Branch Library, 1620 W. Genesee St., Syracuse. Free. (315) 435-5326. Building Day. 10-11 a.m. Children age 3 and up and caregivers can build with Legos, Duplos and other building materials. Liverpool Public Library, 310 Tulip St., Liverpool. Free. (315) 457-0310. lpl.org. Tween Cooking. 2-3:30 p.m. Kids ages 9-12 can create dishes to taste and take home. Liverpool Public Library, 310 Tulip St., Liverpool. Free. (315) 457-0310. Registration required: lpl.org. Earth Day STEAM. 2-3 p.m. Kids age 7 and up can make a terrarium in a jar, learn about water pollution and more. NOPL North Syracuse, 100 Trolley Barn Lane, North Syracuse. Free. (315) 458-6184. nopl.org. Code Dojo. 7-8 p.m. Tweens can join other techies to explore different aspects of technology each month; in this session, they’ll learn about making web pages and apps for smartphones. Liverpool Public Library, 310 Tulip St., Liverpool. Free. (315) 457-0310. Registration required: lpl.org. Robot Petting Zoo. 4-5:30 p.m. School-aged kids and older can play with Dash Robots, Spheros, Codeapillars, Ozobots, Mecchanoid robots and Cozmo. Fayetteville Free Library, 300 Orchard St., Fayetteville. Free. (315) 637-6374. fflib.org. Drop in Crafts. 11 a.m.-7 p.m. Children of all ages can make seasonal crafts. Liverpool Public Library, 310 Tulip St., Liverpool. Free. (315) 457-0310. lpl.org. MasterChef for Kids. 2-3:30 p.m. Kids age 8 and up will work in teams to create a dish using mystery ingredients. NOPL Cicero, 8686 Knowledge Lane, Cicero. Free. Registration required: (315) 699-2032. nopl.org. Petit Teen Book Club. 3:30-4:30 p.m. Teens can talk about favorite books. This month they’ll discuss Angie Thomas’ The Hate U Give. Petit Branch Library, 105 Victoria Place, Syracuse. Free. (315) 435-3636. Spring Break Game Night. 5 p.m. Young people ages 12-18 can play a trivia game as individuals or on teams. Hazard Branch Library, 1620 W. Genesee St., Syracuse. Free. (315) 435-5326. Parenting a Child with Diabetes. 7-8:30 p.m. Pharmacist and diabetes educator Susan Sloane will share information about raising a diabetic child. Liverpool Public Library, 310 Tulip St., Liverpool. Free. (315) 457-0310. lpl.org. Spring Constellations and Planet Observation. 7:30-9 p.m. The group CNY Observers gives an outdoor lecture on spring consellations and tips for remembering their relative positions (Cloud date: May 3). Beaver Lake Nature Center, 8477 E. Mud Lake Road, Baldwinsville. Admission: $4/vehicle. Preregistration required: (315) 638-2519. Pajama Story Hour and Craft. 6:30 p.m. Kids can wear pajamas, hear stories, make a craft and eat a snack. Petit Branch Library, 105 Victoria Place, Syracuse. Free. (315) 435-3636. Glove Monsters. 2-3 p.m. Kids age 8 and up can turn orphaned gloves into stuffed friends. Use provided gloves or bring your own. NOPL Cicero, 8686 Knowledge Lane, Cicero. Free. Registration required: (315) 699-2032. nopl.org. Graphic Novel and Comic Book Club. 4 p.m. Young people ages 12-18 can discuss a book and use it as inspiration for their own graphic novels. This month’s book is Runaways Vol. 1: Pride and Joy, available through Hoopladigital.com. Hazard Branch Library, 1620 W. Genesee St., Syracuse. Free. (315) 435-5326. Party for the Planet. 10 a.m.-3 p.m. Celebrate Earth Day and learn about the zoo’s efforts to sustain biodiversity. See keeper talks and visit activity stations. Rosamond Gifford Zoo, 1 Conservation Place, Syracuse. $8/person, plus zoo admission: $8/adults; $5/age 62 & up; $4/ages 3-18; free/age 2 and younger. (315) 435-8511. rosamondgiffordzoo.org. Be the Scientist. Noon-4 p.m. Explore the activities of a nanoscientist. Museum of Science and Technology (MOST). 500 S. Franklin St., Armory Square, Syracuse. Museum admission: $12/adults; $10/seniors and ages 2-11. (315) 425-9068. Step Up 4 Kids. 8-11 a.m. A Kids Fun Run (9:30 a.m.), 5K (10 a.m.) and children’s activities help raise money for the McMahon/Ryan Child Advocacy Center, in honor of National Child Abuse Prevention Month. Sawmill Creek Shelter, Willow Bay, Onondaga Lake Park, Liverpool. $30-$35/5K; $15/Kids Fun Run. mcmahonryan.org. Barnes & Noble Storytimes. Thursdays, 10 a.m. Join a storytime for toddlers and preschoolers that’s features a book, songs and coloring. Barnes & Noble, 3454 Erie Blvd. E., DeWitt. Free. (315) 449-2948. Community Library of DeWitt and Jamesville (formerly DeWitt Community Library) Storytimes. Mondays, 10:30 a.m., Jan. 8-Feb. 19: Babies & Books (birth to 18 months). Tuesdays, 10:30 a.m., Jan. 9-Feb. 20: Story Play (birth to age 5). Wednesdays, 10:30 a.m., Jan. 10-Feb. 21: Toddler Time (18-36 months). Thursdays, 10:30 a.m., Jan. 11-Feb. 22: Preschool Storytimes (ages 3-5). Community Library of DeWitt and Jamesville, 5110 Jamesville Road, Jamesville. Free. Registration required: CLDandJ.org. (315) 446-3578. Fairmount Community Library Storytimes. Little Movers (good walkers ages 1-3): Mondays & Wednesdays, 10:15 a.m. Small Steps (unstructured play for ages 0-2 years): Tuesdays, 10:15 a.m. Creative Kids (stories and crafts for preschoolers): Mondays, 11:15 a.m., Thursdays, 10:15 a.m. Fairmount Community Library, 406 Chapel Dr., Syracuse. Free. (315) 487-8933. NOPL Brewerton Storytimes. Age 2 and up: Mondays, 10:30-11:30 a.m. NOPL Brewerton, 5440 Bennett St., Brewerton. (315) 676-7484. NOPL North Syracuse Library Storytimes. Birth-age 3: Wednesdays, 10-11 a.m. Ages 3-5: Thursdays, 11 a.m.-noon. Daycare Storytime: Fridays, 10-10:30 a.m. NOPL North Syracuse, 100 Trolley Barn Lane, North Syracuse. Free. Registration requested: (315) 458-6184. Onondaga Free Library Storytimes. Mother Goose Time (age 2 and under): Tuesdays, 11 a.m. Family Storytimes (age 2 and older): Wednesdays, 10 a.m., and Thursdays, 11 a.m. Onondaga Free Library, 4840 W. Seneca Turnpike, Syracuse. Free. (315) 492-1727. Corning Museum of Glass. 1 Corning Glass Center, Corning. Daily 9 a.m.-5 p.m. $18/adults; free/age 17 and under. (800) 732-6845. Ongoing: You Design It, We Make It: Glassblowers choose from among designs submitted by young visitors and create that work on the spot. Erie Canal Museum. 318 Erie Blvd. E., Syracuse. Monday-Saturday, 10 a.m.-5 p.m.; Sunday, 10 a.m.-3 p.m.; closed holidays. Free. (315) 471-0593. Interactive exhibit: Work the Weighlock. The Stonecutters: Exhibit reveals the fascinating world of the stonecutters and quarrymen who built the 83 locks and 18 aqueducts along the 363-mile Erie Canal. Everson Museum of Art. 401 Harrison St., Syracuse. Tuesday-Friday, Sunday, noon- 5p.m. ; Saturday, 10 a.m.-5 p.m. $8. (315) 474-6064. World-class museum includes Children’s Interactive Gallery designed to acquaint beginning art viewers with basic art principles, with areas dedicated to portraiture, hands-on activities, and a classroom. Museum of Science and Technology (MOST). 500 S. Franklin St., Armory Square, Syracuse. Wednesdays-Sundays, 10 a.m.-5 p.m. Open until 8 p.m. on Thursdays. Museum admission: $12/adults; $10/seniors and ages 2-11. IMAX admission only: $10/adults; $8/senior citizens and ages 2-11; (473-IMAX). (315) 425-9068. most.org. Planetarium (only available with museum admission): $2. 425-9068. Hands-on science center features the Bristol Omnitheater, Science Playhouse, Earth Science Discovery Cave, Technotown, and Flight and Space Exhibit. Silverman Planetarium shows “Zoo in the Sky,” for kids under age 8, Saturdays, Sundays and school holidays, 11:15 a.m.; “Seasonal Sky” Saturdays, Sundays and school holidays, 3:15 p.m. Throughout October: Make, a space where children of all ages can build and create. Onondaga Historical Association Museum. 321 Montgomery St., Syracuse. Wednesday-Friday, 10 a.m.-4 p.m.; Saturday & Sunday, 11 a.m.-4 p.m. Donation. (315) 428-1864. Syracuse’s only comprehensive local history museum, with exhibits on architecture, local industries, transportation and more. Rosamond Gifford Zoo at Burnet Park. 1 Conservation Place, Syracuse. Daily, 10 a.m.-4:30 p.m. $8/adults; $5/senior citizens; $4/children; free/age 2 and younger. 435-8511. Ongoing attractions include Humboldt penguins. Sciencenter. 601 First St., Ithaca. Tuesday-Saturday, 10 a.m.-5 p.m.; Sunday, noon-5 p.m. Admission: $8/general admission, ages 2-64; $7/seniors; free/under 2. (607) 272-0600. sciencenter.org. Inspires people of all ages to discover the excitement of science through exhibits and programs. Explore the Sciencenter’s interactive exhibits. Mini-Golf course open April 1-Nov. 30, weather permitting. Admission: $7/age 4 and older; free/ages 0-3 with paid adult. Strong National Museum of Play. 1 Manhattan Square, Rochester. Admission: $14; free/younger than 2. (585) 263-2700. Permanent exhibits include National Toy Hall of Fame with inductees such as alphabet blocks, Barbie, Crayola crayons, G.I. Joe and the ever-versatile cardboard box. Also, super-sized kids’ market and more; lunch available at Bill Gray’s Skyliner Diner. Send information about your family-friendly event to: Family Times calendar, 1415 W. Genesee St., Syracuse; fax to (315) 422-1721; or email to editorial@familytimes.biz. Include date and time of event, location with numbered street address and town, price, and phone number for publication. We give priority to low- or no-cost events aimed at parents, kids, or parents accompanied by kids. For consideration, listings are due by April 6 for the May issue.